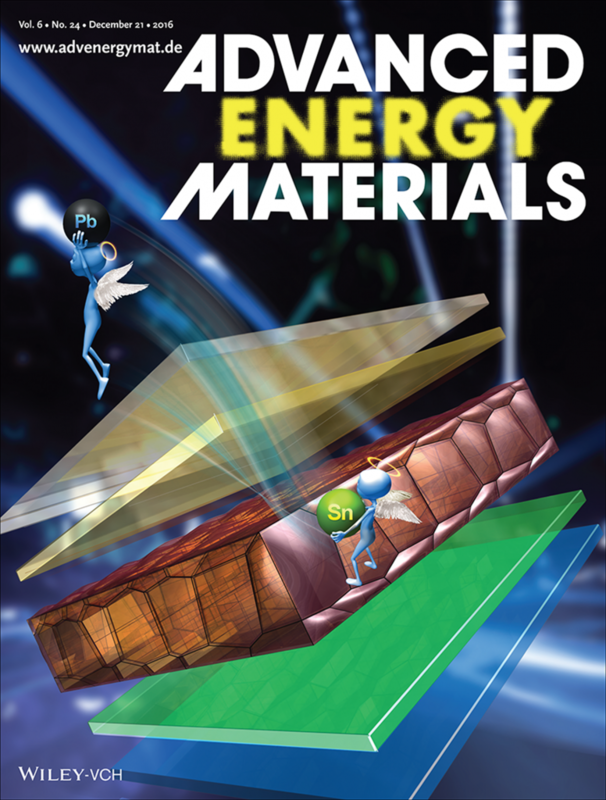 On the Cover: Lead-free perovskite solar cells (PSCs) are very much in demand for future high-efficiency renewable electricity generation. In article number 1601130, Yuanyuan Zhou, Nitin P. Padture, Xiao Wei Sun, and co-workers report efficient planar heterojunction-depleted PSCs with power conversion efficiency up to 3.31% without the use of any additives, via modulation of phase-pure B-γ-CsSnI3 grain coarsening. The delicate control of grain-coarsening engineering plays a critical role in determining the morphology of photoactive layer, the exciton dynamical behaviors and thus the device performance. Ning Wang, Yuanyuan Zhou, Ming-Gang Ju, Hector F. Garces, Tao Ding, Shuping Pang, Xiao Cheng Zeng, Nitin P. Padture and Xiao Wei Sun. 2015. Solar Cells: Heterojunction-Depleted Lead-Free Perovskite Solar Cells with Coarse-Grained B-γ-CsSnI3 Thin Films. Adv. Energy Mater., 6: n/a. doi:10.1002/aenm.201670137. Xiao Cheng Zeng is Chancellor’s University and Willa Cather Professor of Chemistry.